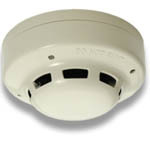 A smoke detector is a device that detects smoke. Commercial, industrial, and mass residential devices issue a signal to a fire alarm system, while household detectors, known as smoke alarms, generally issue a local audible and/or visual alarm from the detector itself. Once submitted, we will try and place you in contact with a suitable Smoke Detectors (Industrial) supplier within 48 hours. SZA-NA(FM) High Sensitivity Smoke Detection System from Hochiki America Corp.